Many fields of science are transitioning from null hypothesis significance testing (NHST) to Bayesian data analysis. Bayesian analysis provides rich information about the relative credibilities of all candidate parameter values for any descriptive model of the data, without reference to p values. Bayesian analysis applies flexibly and seamlessly to complex hierarchical models and realistic data structures, including small samples, large samples, unbalanced designs, missing data, censored data, outliers, etc. Bayesian analysis software is flexible and can be used for a wide variety of data-analytic models. (More about why to go Bayesian is described below.) This course shows you how to do Bayesian data analysis, hands on, with free software called R and JAGS. The course will use new programs and examples. This course is offered through the University of St. Gallen Global School in Empirical Research Methods (GSERM), Switzerland. Registration is required and links are provided below. an extensive array of applications, including comparison of two groups, ANOVA-like designs, linear regression, logistic regression, ordinal regression, etc. Also numerous variations for robustness to outliers, non-normally distributed noise, heterogenous variances, censored data, non-linear trends, auto-regressive models, etc. See more details in the list of topics, below. The intended audience is advanced students, faculty, and other researchers, from all disciplines, who want a ground-floor introduction to doing Bayesian data analysis. No specific mathematical expertise is presumed. In particular, no matrix algebra is used in the course. Some previous familiarity with statistical methods such as a t-test or linear regression can be helpful, as is some previous experience with programming in any computer language, but these are not critical. Robust Bayesian estimation of difference of means. Software: R, JAGS, etc. NHST t test: Perfidious p values and the con game of confidence intervals. Bayes’ rule, grid approximation, and R. Example: Estimating the bias of a coin. Markov Chain Monte Carlo and JAGS. Example: Estimating parameters of a normal distribution. HDI, ROPE, decision rules, and null values. Hierarchical models: Example of means at individual and group levels. Shrinkage. Examples with beta distributions: therapeutic touch, baseball, meta-analysis of extrasensory perception. Simple linear regression. Exponential regression. Sinusoidal regression, with autoregression component. How to modify a program in JAGS & rjags for a different model. Robust regression for accommodating outliers, for all the models above and below. Hierarchical regression models: Estimating regression parameters at multiple levels simultaneously. Hierarchical model for shrinkage of regression coefficients in multiple regression. Variable selection in multiple linear regression. Model comparison as hierarchical model. The Bayes factor. Doing it in JAGS. Two Bayesian ways to assess null values: Estimation vs model comparison. Bayesian hierarchical oneway “ANOVA”. Multiple comparisons and shrinkage. Example with unequal variances (‘heteroscedasticity’). Bayesian hierarchical two way “ANOVA” with interaction. Interaction contrasts. Log-linear models and chi-square test. Power: Probability of achieving the goals of research. Applied to Bayesian estimation of two groups. The goal of achieving precision, instead of rejecting/accepting a null value. How to report a Bayesian analysis. Other data distributions in JAGS using Bernoulli 1’s trick. Stan and Hamiltonian Monte Carlo. Mike Kalish is a Professor of Psychology at Syracuse University. He has taught several post-graduate level seminars on Bayesian Data Analysis for Psychological and Cognitive Science. His research interests include the science of category learning and Bayesian data analysis. His work has been funded predominantly by the US National Science Foundation and the Australian Research Council. 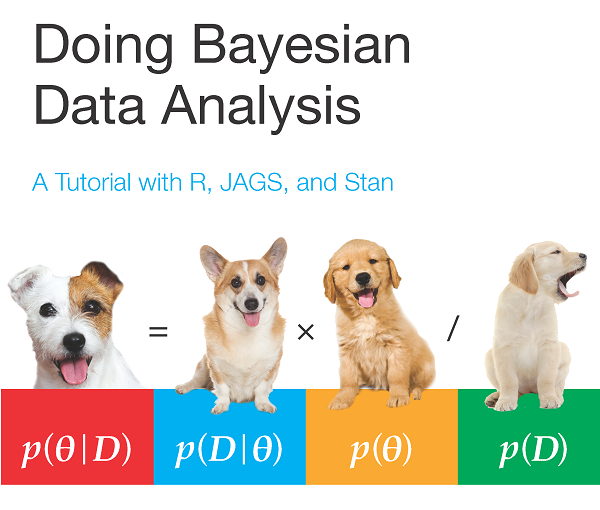 Doing Bayesian Data Analysis, 2nd Edition: A Tutorial with R, JAGS, and Stan. The book is a genuinely accessible, tutorial introduction to doing Bayesian data analysis. The software used in the course accompanies the book, and many topics in the course are based on the book. (The course uses the 2nd edition, not the 1st edition.) Further information about the book can be found here. This course is offered through the University of St. Gallen Global School in Empirical Research Methods (GSERM), Switzerland. You must register to attend. Complete registration and contact information is at this link. The instructor has no control of fees or registration procedure. It is important to bring a notebook computer to the course, so you can run the programs and see how their output corresponds with the presentation material. Please install the software before arriving at the course. The software and programs are occasionally updated, so please check here a week before the course to be sure you have the most recent versions. For complete installation instructions, please refer to this web page. An introductory chapter from the text that explains the two foundational concepts of Bayesian data analysis. Kruschke, J.K. (2013). Bayesian estimation supersedes the t test. * Journal of Experimental Psychology: General, 142(2), 573-603. More info, including links to videos, is here. Kruschke, J.K. & Liddell, T.M. (2017). The Bayesian New Statistics: Hypothesis testing, estimation, meta-analysis, and power analysis from a Bayesian perspective. Psychonomic Bulletin and Review. doi:10.3758/s13423-016-1221-4. Kruschke, J.K., Aguinis, H., & Joo, H. (2012). The time has come: Bayesian methods for data analysis in the organizational sciences. * Organizational Research Methods, 15(4), 722-752. Data analysis involves “generic” descriptive modelsBayesian data analysis is not Bayesian modeling of cognition. of cognition. Read more at this blog entry.